First, lay the pineapple on a cutting board and remove the top and bottom of the fruit. Cut the fruit lengthwise into quarters and run your knife through the flesh about 1/4″ from the core. 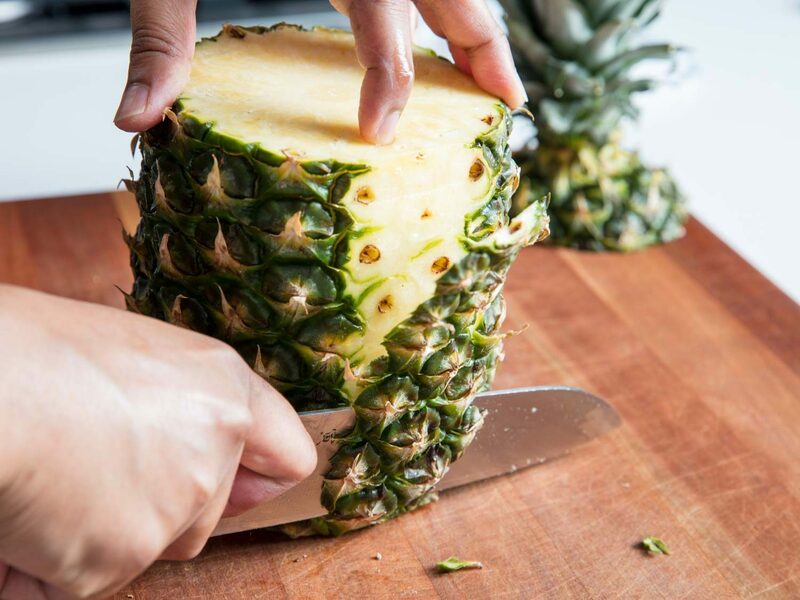 Remove the flesh of the pineapple from the skin of the fruit with a sharp knife. Cut the pineapple flesh into chunks as desired. Begin by placing your Chestnut Hill Farms pineapple onto a cutting board and by cutting about 1/4″ from the top and the bottom of the fruit. Place the pineapple vertical on the cutting board. Next, slice off strips of the pineapple skin by placing your knife 1/4″ inside the edge of the fruit and press down gently. Repeat this step until all of the skin has been removed from the pineapple. Finally, remove any “eyes” left on the fruit’s flesh with a peeler. Then quarter the pineapple lengthwise and run your knife through the flesh of the fruit, about 1/4″ from the core. Cut into slices and enjoy! First, remove the top and bottom of your perfect pineapple. Next, peel the fruit by placing your knife about 1/4″ into the fresh and press down gently. Place the pineapple in an upright position and make a cut from the top of the fruit to the bottom about 1/4″ from the core. Repeat this step until all of the “meat” has been removed from the core of the pineapple. Finally, slice your pineapple into chunks as desired. Watch the Easy Way to Cut a Pineapple Here! This entry was posted in Featured, Latest News, Recipes, Tips & Tall Tales and tagged cut pineapple, pineapple. Bookmark the permalink.